Cleaning and maintaining your own portable restroom unit can be a dreaded task. In fact, without the proper tools it may be next to impossible. 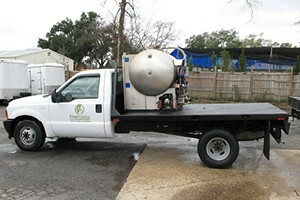 When the time comes and you need your portable restroom cleaned, give us a call. You’ll love the fact that our team of sanitation experts can be on-site within 24 hours to pump and clean your customer owned portable restroom. Each signature service includes a complete pumping of your restroom’s waste tank, a sanitizing rinse and restocking of supplies. Upon arrival, our service technician will inspect your restroom to make sure everything is in operational order. We’ll then proceed to pump any waste that may be in the holding tank. Once finished, a chemical recharge will be performed on the tank using our concentrated, non-hazardous and non-staining deodorizing solution. This solution will leave your restroom smelling fresh and will help deter future odors. A sanitizing rinse is then performed on the interior of your restroom. This rinse leaves your bathroom sanitized and clean. After your unit is sanitized our technician will then proceed to restock your portable restroom supplies. This includes two rolls of toilet paper for a basic portable restroom and a water recharge with soap and paper towels on deluxe units with internal sinks. Contact a member of our customer service team today and arrange to have your portable restroom cleaned and sanitized. Services can be scheduled as will call or can be set to weekly, every other week or monthly servicing. We look forward to speaking with you.